It is important to me to recognize the most influential person I have had in my life for the past thirty-one years: my husband, Steve. 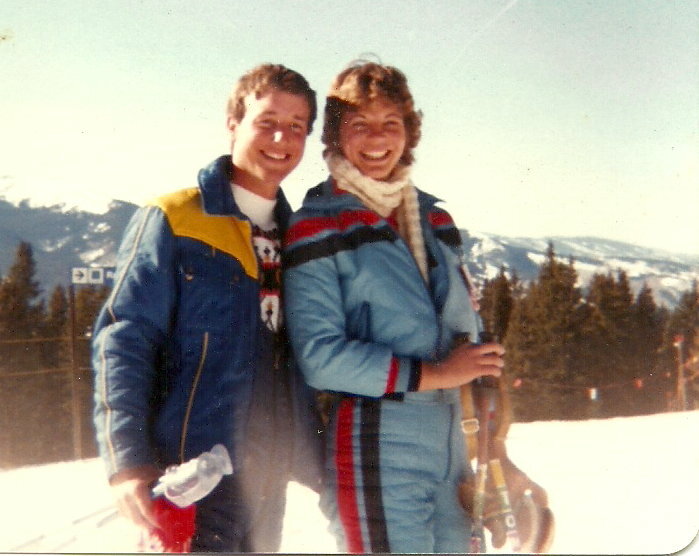 Steve and I on a ski trip in 1980. 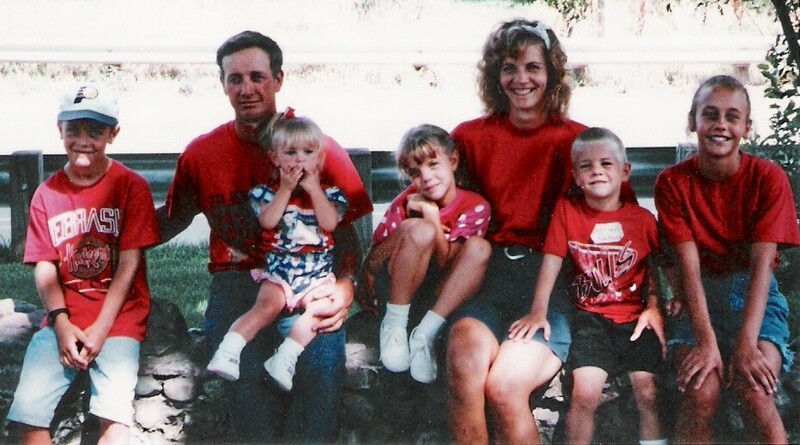 Steve grew up on a farm near Snyder, NE. He dreamed of feeding cattle and farming as soon as he could start playing with tractors and building little pens in the dirt. It was in his blood. His dad and grandfather were cattle feeders and perhaps his German ancestors were as well. Steve and I met at a wedding dance in Snyder. I was with the brother of a good friend of Steve’s. Steve sat across the table from me most of the night and wooed me with stories about his horse. I didn’t remember his name until he stood up to leave and I noticed the cut out letters “S-T-E-V-E” on the back of his belt. is sitting next to me. Steve didn’t remember my last name but he did remember where I worked. The Monday following our first encounter I heard the phone ringing as I was unlocking the door to the veterinary clinic that I was working at. I hustled over to the counter figuring it was an emergency call for the vet. It was Steve! He was wondering if I would want to come out to his farm and ride his horse that next weekend. Well, yes, I responded and the rest, as they say, is history. 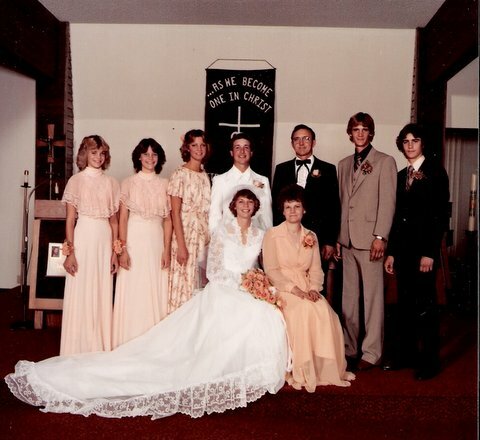 We were married in September of 1981. I didn’t know much about feeding cattle but I was excited about living on a farm. I always loved animals and had gone to college in Curtis, NE to be a veterinary technician. I found that my knowledge of doctoring combined with my concern for the well being of animals was an asset to our business. Steve and Kim, Emily, me, Jeff and Ginger. Steve and I started having children so my work on the farm was limited to the chores I could do with the kids in tow and book work. We had moved to the vacant farm that Steve’s dad was born and raised on and eventually purchased it from Steve’s uncle. We faced financial difficulty in those early years. Every penny was accounted for and we didn’t buy what we didn’t need. The focus was on building the farm so that in the future the farm could give back. It was tough but Steve had a vision and the work ethic to see it through. while Zoe looks on with anticipation. 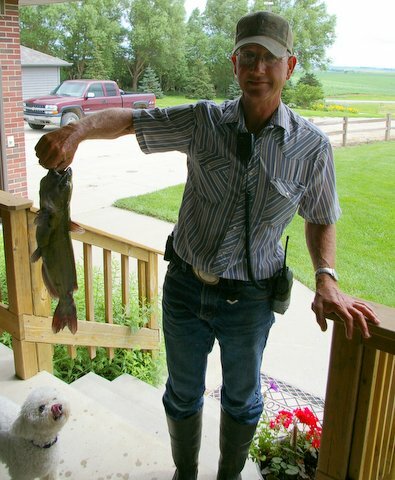 While Steve loves feeding cattle he also has a hobby that is near and dear to his heart. Steve is a fisherman and has many tales of fishing as a boy in a nearby creek. When we were able to take a fresh water holding pond and make it into a fish pond Steve saw a dream fulfilled that he never thought possible—a fish pond only a few hundred feet from our house. One can find Steve fishing early in the morning, mid morning, lunch time and in the evening during the warmer days of the year. While I don’t have the fishing bug that Steve has, I do enjoy spending time in the paddle boat or roasting marshmallows in a nearby campsite we built. We have faced many challenges together. The external challenges revolve around weather and markets. I had to learn early on the importance of timing when it comes to farming. One summer day I had planned to take the three young kids we had at the time to a circus in Norfolk. Steve said, no, the hay had to be baled that night (we also picked it up right away in case of rain and I drove the hay rack across the field). I shared this story once with a group of students that were our Ag Pen Pals in Lincoln. They were shocked that our kids had to miss the circus. I then explained to the students that many farms grow to add employees so that family activities can be attended. cattle line up to the bunk to eat. 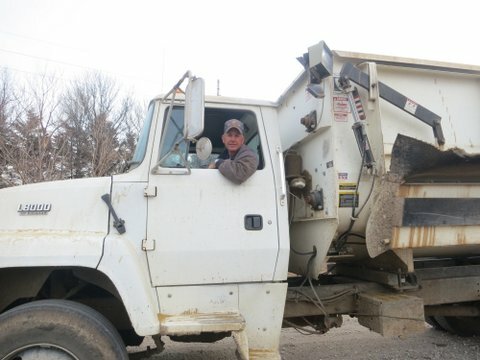 We have been fortunate to have employees to help us with our labor. Taking care of livestock is a full time job seven days a week, on holidays and when the weather is blistering hot or bone chilling cold. While I get moments of burn out from the lack of time off, Steve seems to run on Energizer batteries. It has been said that if you love what you do it won’t seem like work. Steve has passion for what he does and he does it very, very well.